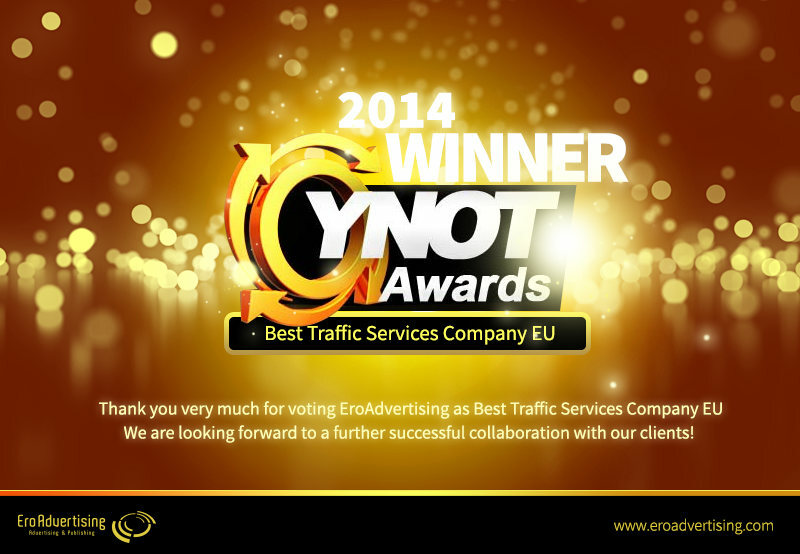 Oss, Netherlands - The global adult ad network EroAdvertising is proud to announce to win in the category “Traffic Service Company EU” at the YNOT Awards 2014 that took place on September 23rd in Prague. The award comes as a well deserved reward and marks yet another year on top of the game in an ever more competitive business of providing traffic services. Rewarding both, the constant effort to innovate and optimize, and the company's strong belief in providing personal attention and local support to its publishers and advertisers. “This is a great honor, especially since all the nominees and also the eventual winner were chosen by actual industry people themselves" says Jan Huibers, CEO of EroAdvertising. "A major part of the people who voted for us, or who even cheered for us in the audience at the show are our clients, and that's the best reward one can get, I'm very proud of my team" adds Huibers. The company plans to introduce yet another set of new features and improvements in the near future, including practical guides for its clients so they can take full advantage of the wide range of complex features offered in order to improve their results. For more information and an opportunity to join the line up of satisfied clients please visit www.ero-advertising.com. EroAdvertising, founded in 2006, is a multi-award winning adult ad network offering its more than 15 000 Publishers a unique selection of proprietary, cutting edge features for advanced campaign targeting. Supported by an experienced team of international account managers covering each particular geo-region. Visit EroAdvertising to buy or sell traffic. Take advantage of the accurate, reliable tracking, state of art traffic targeting features and dedicated account managers to get more return from your traffic with EroAdvertising! Visit EroAdvertising PR Bot's homepage!